An IMCA modified concy started the night after a brief intermission. Only the top five from the 10 lap shootout would transfer to the feature. Underwood's Donald Robinson started on the pole but young Eric Fetzer quickly took the lead. 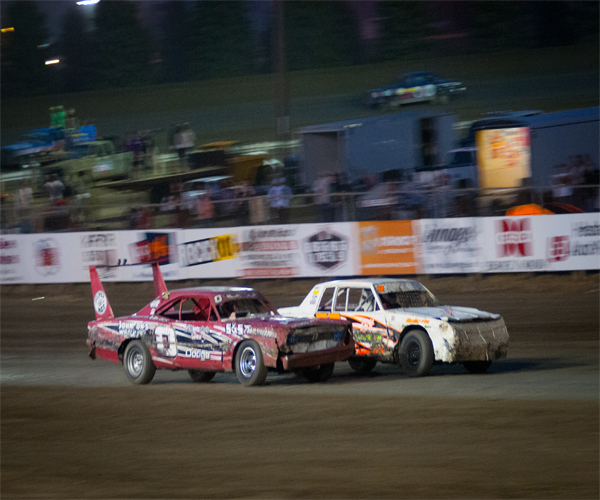 As Fetzer distanced himself from the field, Robinson was trying to hold off Brad Steffes for second place. As the two drivers battled for second, fourth place Spencer Wilson quickly caught them and passed Steffes for third. The following lap, Wilson passed Robinson for second. Lapped traffic allowed Wilson to quickly catch leader Fetzer and with two laps to go, Wilson was all over the leader's back bumper but Fetzer held off Wilson for the concy win. Robinson finished third as Wyatt Dinius made a last lap pass to finish fourth ahead of Steffes. Andy Heidrich started on the pole for the Hobby Stock feature. Heidrich got loose early and fell out of the top 10, handing the lead over to Wishek's Dana Welder. Welder had company up front however as championship contenders Scott Gartner and Jeremy Engelhardt made it a three car battle for the lead. Gartner shuffled into the lead before a six car wreck in turn four regrouped the field. After a series of quick cautions, Gartner and Engelhardt pulled away from the field. With five laps to go, Gartner and Engelhardt raced door to door for the lead. Engelhardt took the lead from Gartner with three laps to go but Gartner rallied back. The two drivers raced side by side for the win and as they crossed the Open Road Honda finish line, Engelhardt just narrowly edged Gartner for his third feature win in a row and clinch the track championship. Dana Welder held off Chad Hausauer for third and Aaron Aaseth rounded out the top five. Pole sitter Adam Meuchel found trouble early in the INEX Legends feature when he spun his number seven car while racing up front. Kevin Jensen led the field to the restart but Steven Kuntz's low line stole the lead away. Kuntz's lead was short lived when Ivan Sailer bursted into the number one position. Sailer held onto his lead after a series of quick cautions but on a restart with eight laps to go, Kuntz and championship contender Donavin Wiest took it three wide for the lead. Kuntz retook the lead from Sailer as Wagner slipped by Wiest for third. A caution with two laps to go reset the field for a Green-White-Checkered restart. On the restart, Paul Huettl, Shane Williams and Zach Lutz went three wide for fifth place. When they crossed the finish line, Williams finished fifth behind Wagner, who lost third place to Wiest. The third place finish was enough for Wiest to win the track championship. Up front, Kuntz picked up feature win number four over Sailer. It was no surprise to anyone when Jamie Schlafmann took the lead in the IMCA Sport Compact feature. Schlafmann pulled away quickly until Michelle Stoxen lost a tire on lap three and regrouped the field. Once again, Schlafmann drove away from the field on the restart. 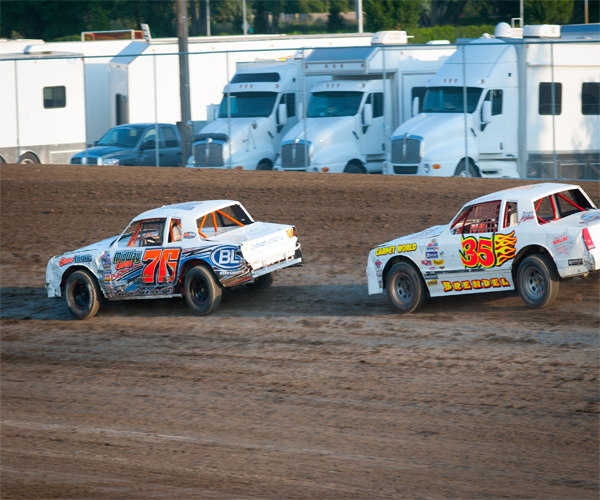 Nic West and championship contender Derek Nitschke battled for second. With two laps to go, West over drove turn four, as a result from a cut tire, handing second place to Nitschke. Schlafmann led all 10 laps to win the feature. 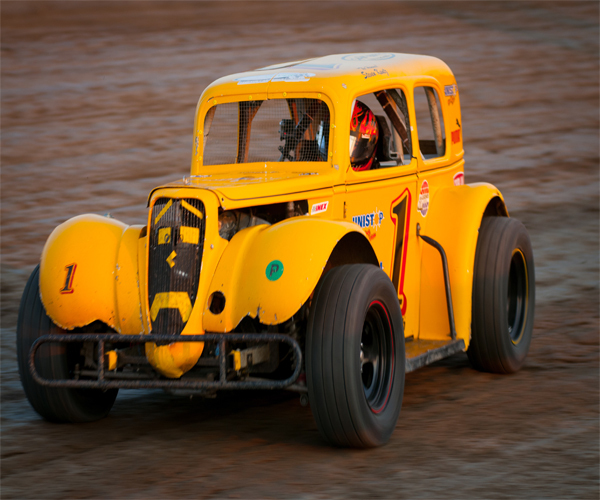 Nitschke finished second which was enough to win his second track championship at the Dacotah Speedway. Josh Roehrich finished third ahead of Nylee DiMeo and Alex Thompson. Matt Brendel and Carrie Mundahl started on the front row of the WISSOTA Street Stock feature. Brendel held onto his lead until last week's feature winner Tanner Dosch took the lead away on lap four. Dosch pulled away until a couple of caut ions slowed the race down. On the lap eight restart, Dosch pulled away once again until he got loose out of turn four and over drove turn one and rolled his car into the turn one guard rail. Dosch was ok but his night ended due to a piece of debris cutting his left rear tire. Brendel inherited the lead and on the restart, Jeremy Schmidt took his car low and into the lead with nine laps to go. Schmidt pulled away while his championship contenders, Brad Kadrmas and David Falkenstein, were mired back in the field. Schmidt went on to win his third feature of the season, the only driver in the WISSOTA Street Stocks to win multiple times at the Dacotah Speedway. Matt Brendel finished a distant second ahead of Zach Frederick, Eric Paul and Shawn Volk. Despite leading the final nine laps and winning his third feature of the season, Schmidt was two points short of clinching the championship. 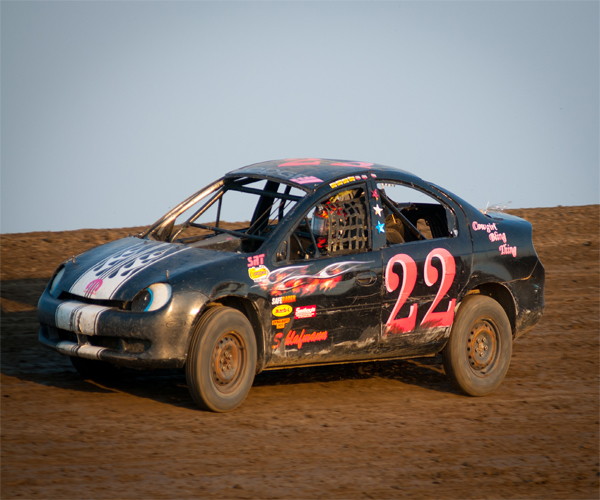 Brad Kadrmas's ninth place finish was just enough to win back to back championships at Dacotah Speedway. In the final feature of the night, John Gartner Jr and Brian Swenson raced side by side for the lead in the IMCA Modified feature. Gartner Jr held onto his lead before lap two caution reset the field. On the restart, Tracy Domagala blew by Gartner for the lead, bringing Marlyn Seidler with him. Domagala pulled away while Seidler tried to hold off a strong Shawn Strand for second. Strand wasted no time as he passed Seidler and quickly reeled in leader Domagala. On lap nine, Strand took the lead from Domagala before the caution came out the following lap. On the restart, Jeremy Keller passed Seidler and Domagala and quickly passed Strand for the lead. Strand rallied back and they raced side by side for the lead until Strand retook the lead with nine laps to go. 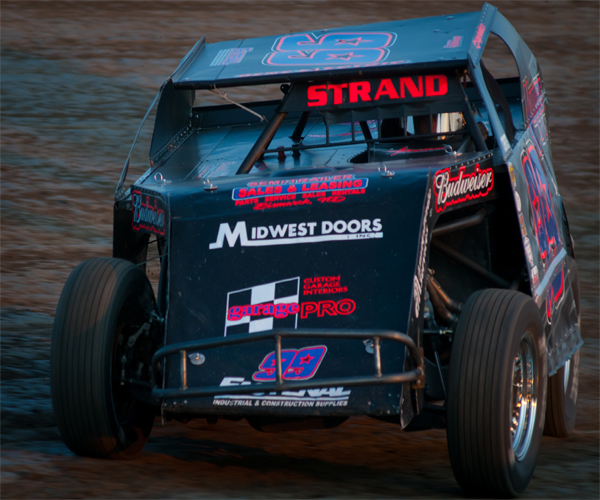 Strand held off Keller in a series of late race cautions to win his third feature of the season. Keller's second place finish wrapped up the IMCA Modified track championship. Robert Hellebust finished third while Seidler finished fourth and Mark Dahl. The Dacotah Speedway would like to thank all its loyal and dedicated fans. Thank you to all the drivers for traveling from near and far to race on our high banks of Dacotah Speedway. A huge thank you to all of the track volunteers who make race day happen each Friday night. We hope to see everyone back in 2014!